JACKSONVILLE, Fla., Sept. 20, 2016 /PRNewswire-USNewswire/ -- In an effort to ensure more veterans and caregivers receive the support they need, Wounded Warrior Project® (WWP) and the Department of Veterans Affairs (VA) Coaching Into Care program will simultaneously stream three back-to-back Q&A forums using Facebook Live, beginning at 7 p.m. tomorrow. "These forums are one of the many ways we are breaking through organization boundaries by working closely with industry leaders to ensure wounded warriors receive the care they deserve," said Mike Linnington, WWP chief executive officer. 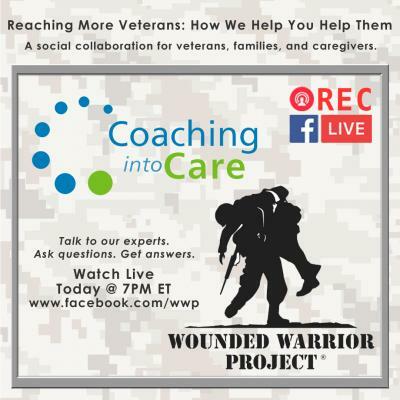 WWP and the VA Coaching Into Care program will engage warriors, their families, and caregivers in a virtual environment – giving them a unique opportunity to ask subject matter experts about some of today's most pressing issues. In return, the two organizations will be able to receive essential feedback from those they serve to enhance programs offered to veterans. WWP & VA Coaching Into Care 101: What exactly do we do? Barriers to Care: What's stopping you or your veterans, and how can you change that? Who: All injured veterans, their families, and caregivers are welcome to watch, interact, and share. Why: Injured veterans, their families, and caregivers deserve the support & care they earned. Coaching Into Care is a national telephone-based VA support service for family members and others who want to help reluctant Veterans access their VA health care, particularly for mental health issues. Its purpose is to help family members and other loved ones encourage distressed Veterans to access VA Care successfully anywhere in the United States. The mission of Wounded Warrior Project® (WWP) is to honor and empower Wounded Warriors. The WWP purpose is to raise awareness and to enlist the public's aid for the needs of injured service members, to help injured servicemen and women aid and assist each other, and to provide unique, direct programs and services to meet their needs. WWP is a national, nonpartisan organization headquartered in Jacksonville, Florida. To get involved and learn more, visit woundedwarriorproject.org. For additional media assets, visit the WWP News Room.